If you live in a hot, dry and arid climate, a date palm, Phoenix dactylifera, may fit perfectly into your landscape. Date palms are erect, elegant trees that over time can grow to 100 feet in height. Naturally the date palm grows in the deserts of the Middle East, but in the United States date palms are often found in Southern California and Arizona. The date palm is a slow growing tree, growing 6 inches a year on average. It is easy to grow and maintain, if you follow a few simple requirements. Choose a spot in your landscaping that received several hours of sunlight per day. Date palms thrive in sunlight and must receive at least several hours a day. Dig a hole with your shovel that is two to three times wider than the root ball of your potted palm. You want to plant the date palm only as deep as it is in the pot you bought it in. Make the hole only that deep, plus about 6 inches. Put 2 inch layer of moist, organic material and decomposed manure in the bottom of the hole. On top of this, put 2 to 3 inches of the soil you dug out of the hole. Then, place the root ball of your date palm on top of this layer. Mix the remaining soil you dug out with two or three shovels full of manure, and use it to fill the hole around your date palm. As you fill the hole, use a hose to add water into the hole, root ball and soil. This will help eliminate any air bubbles in the root ball and help the roots establish themselves better in the soil. Dig a shallow reservoir around the base of the date palm, but several inches out. Mulch around the date palm, but do not cover too much of the base; also put mulch into the reservoir. This reservoir with be used when you water and help put water deep into the soil. Keep the soil around your newly planted date palm moist for the first several weeks by using a soaker hose around the base. Although date palms are drought tolerant when established, newly planted date palms need to be kept in moist, not soggy, soil so it can establish its roots. Too little water will weaken your date palm. Check the soil moisture daily for the first week or two. The date palm will establish its roots in about two months if the soil is kept moist during that time. Water your date palm every two to three weeks by deep root watering. Date palms have very deep roots, so the watering must be enough to soak down to the roots. A long, slow watering system, like a soaker hose, works well. Fertilize your date palm once a year with manure. 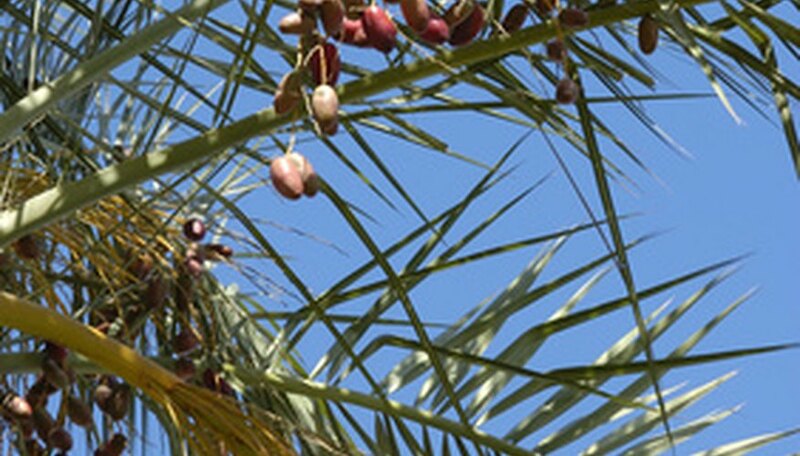 You can also use commercial fertilizer that is formulated for date palms. Follow the directions on the package. Prune any dead fronds from your date palm once a year. Do not over prune--for every new frond, an old frond will die. Date palms can tolerate almost any soil type as long as it drains well. You can plant your date palm at anytime during the year, but spring is when most people plant date palms. What Palm Has Three Trunks?